The Ritz. Two words. So much history. When I discovered that the Ritz Paris cookbook would be released this fall (next week to be exact), I knew I wanted to check it out. The book is being published by Flammarion and distributed by Rizzoli New York here in the states. The wonderful folks at Rizzoli offered to send me a copy to review (thanks as always!). My first impression was that the book itself was really beautiful. The food inside is quite elegant as expected, and the photos are a definite highlight of the book. "To Whet Your Appetite," the book starts with a lovely introduction to both Cesar Ritz and Auguste Escoffier, the two men responsible for starting this timeless example of high class luxury. It then proceeds to highlight the Ritz's current leader, it's Executive Chef (and winner of SOOOOOO many prestigious cooking awards including the Bocuse d'Or) Michel Roth. The introduction captures the prestige and culinary history of this highly regarded institution. For example, there isn't a single culinary school that does not praise the influence of Escoffier. These are pretty much the duel Godfathers of modern day fine dining. So yeah, let's give them props. These babies of course started to sink as I was taking pictures... just know they were a bit more souffled than this when they came out of the oven :) The End. I would consider this book to be more of a "coffee table" type of book. The recipes are definitely intended for advanced cooks. I'm not gonna sugar-coat it. Many recipes call for exotic ingredients, meanwhile, the method of prep for each recipe is pretty bare bones. On the one hand, I like the no-muss-no-fuss style of writing, very much like bullet points of what to do, but a lot of potentially helpful information is lacking. If you're not an accomplished chef, you may find some of it challenging (for the record, I'm formally trained and a culinary school graduate, and I still thought that the recipes could use a bit more information in many cases). 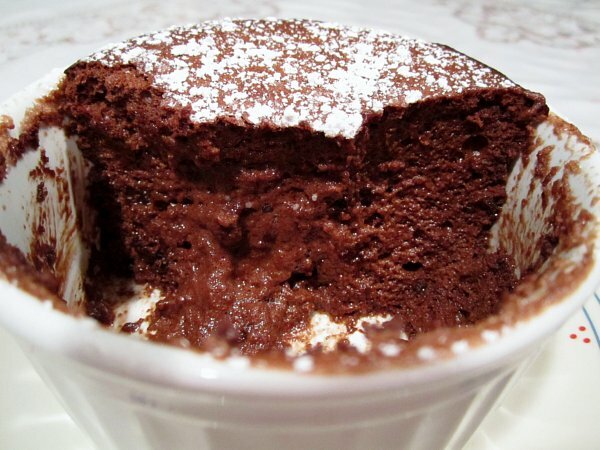 I elected to try the Vendrome Chocolate Souffle, mainly because it seemed to be one of the easiest in the book :-D and also it's CHOCOLATE SOUFFLE. It was actually very easy to put together! I was unable to find the Valrhona chocolate that the recipe called for so I simply substituted other chocolates of the same cocoa contents. I also replaced potato starch with cornstarch, which worked just fine and I believe is more readily used in the US than in Europe (maybe?) with similar results. 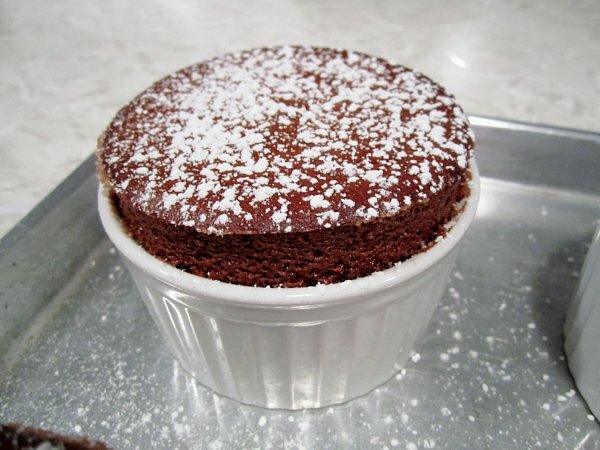 The souffles were delicious. Absolutely delicious! I would totally make them again. Word. I do have a few little issues to point out (I hate to be that girl, but I'm going there...). The recipe says it yields 4. Fair enough. It does not, however, specify a ramekin size. I figure a 1 cup capacity ramekin is pretty average. 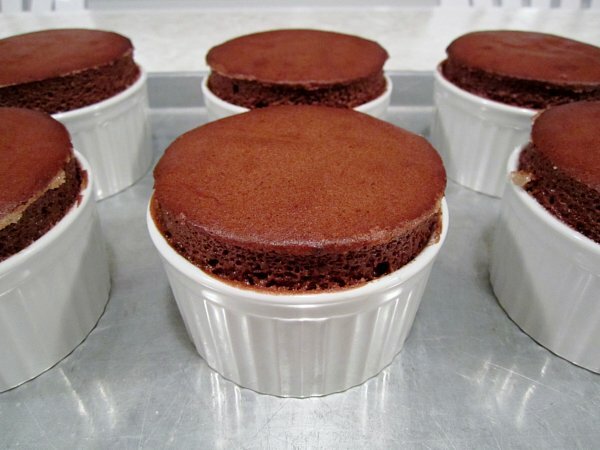 I got 6 souffles in my 1 cup ramekins. So there's that. I also baked at the exact temperature it specified, and for the correct period of time. I needed to add more time to get them to bake through a bit more. I know they should be gooey in the center, but they were still very undercooked for me after the 9 minutes it called for, meanwhile the edges of the tops were slightly starting to burn. I think the oven temperature is just a bit too high. In the future, I will lower it a tad and add more time and see if that adjustment makes a difference. Otherwise I do think the flavor is exceptional and totally worth a try. I made several adjustments and additions to the method of prep in the recipe below, fyi. Overall, I think this is a great book for lovers of the Ritz Paris (and for those infatuated with the history of French cooking and fine dining), but I don't believe it is meant to be a standby cookbook for average folks. This is special occasion cooking for sure, and with that said, I hope you have the skills to back up the recipes because they are not for beginners. Roughly chop both types of chocolate and melt them, stirring occasionally, over a double boiler (or a metal bowl set over a pot of simmering water). Meanwhile, whip the egg whites and sugar in the bowl of an electric mixer fitted with the whisk attachment until you achieve stiff peaks. Bring the milk and potato starch (or cornstarch) to a boil, whisking continuously, until thickened. Carefully strain the mixture (there may be burned, curdled bits... you don't want those) and whisk into the egg yolks. Incorporate a dollop of the whipped egg whites into the milk, starch, and yolk mixture. Fold a dollop of whipped whites into the melted chocolate. Combine the 2 mixtures, and then carefully fold in the remaining egg whites. Use a flexible rubber spatula to do so, as this will help you reach the bottom of the bowl and combine everything well. 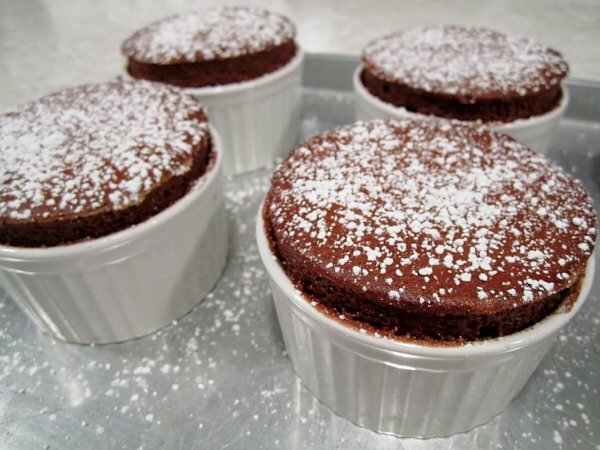 Butter the bottom and sides of 6 (1-cup) ramekins and dust the insides with sugar, knocking out any excess. 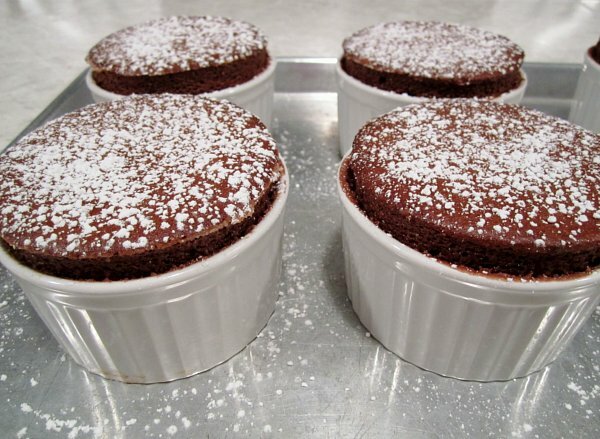 Fill them to the top with the souffle mixture, and bake for 9 minutes (or longer as needed) at 465 degrees F, until puffed up about 1-to-1 1/2 inches from the top of the ramekins. Do NOT open the oven door until the souffles are done. Dust with confectioners' sugar if desired and serve immediately.